What is the Senior Music Network? Our primary business is radio. With The Senior Music Network, we use the same listener techniques as America’s top rated radio stations. It is played and mixed according to popularity, genre, age, tempo, and category. These techniques keep residents interested and listening. They love us! We are not background music. We are foreground. Residents leave us on for long enjoyable hours. Listen to our programming from Regency Oaks in Clearwater, Florida. Some of our song titles are announced and the music is mixed with short messages from our announcer about the communities they serve. Some are safety messages, others are informational. Executive and activities directors have a message each hour so residents hear them daily. We provide companionship. Research during our beta tests in Southern Florida demonstrated that residents enjoy the messages and told us they feel like someone in the community is keeping them company. The researched music we play for each community differs slightly. It is tailored to the demographics of that community. A majority of our communities transmit us as the audio on their closed circuit TV information channel. If your community doesn’t have a special TV channel, we can set one up for you. Some communities use us on overhead speakers and in addition have a special room where our music plays all the time. We can also arrange to be broadcast on a closed circuit FM frequency so residents can hear us on their radios. 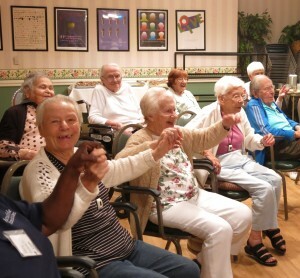 Every piece of research about seniors has now clearly shown that music is an important part of their happiness. This is the music of their lives. They grew up with it, got married to it and had children as it played. Radio stations stopped serving senior citizens over 20 years ago so as this music re-enters their lives, they are delighted. Call us for more information. Everywhere we have been installed, the community executives get more compliments than they ever thought possible. We make residents happier and we offer a 60 day free trial to prove it. Playing the Artists Seniors want to hear – we know – we do the research! What is the Senior Music Network – how does this work? We are Lifestyle Radio & TV. After your free trial, we would never think of discontinuing service. Keep it coming! Residents are absolutely in love with the music and messages.